PSE&G 120 MegaWatt “Solar 4 All”, All for Solar! Featuring a novel 40 MegaWatt (MW) deployment of photovoltaic (PV) solar modules on utility poles. PSE&G Vice President – Renewables and Energy Solutions Al Matos interview. PSE&G’s “Solar 4 All” Plan webpage includes a Fact Sheet, the BPU Filing, additional statements, photos, and videos. Wednesday afternoon, I chatted at length with PSE&G Vice President – Renewables and Energy Solutions Al Matos about the Neighborhood Solar portion of the plan placing solar modules on 200000 utility poles and street lights in the PSE&G service area. 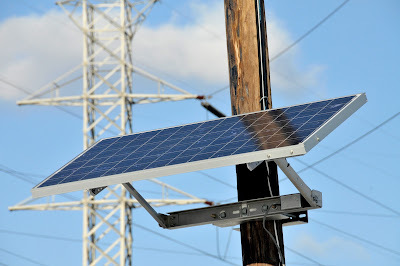 PSE&G progressed through these obstacles, solving the issues one by one and integrating the utility pole solar concept into their theme of visible and local solar in neighborhoods, schools and municipal buildings, and gray/brown fields. Two technology developments were fundamental enablers: smaller, more efficient PV modules and micro-inverters. And last, a module mounting method was found to optimize power output (south facing at a slight angle) without being a hazard to the utility workforce. Next, PSE&G decided to select 200000 utility poles with 120 Volt Alternating Current (VAC) lines from the 900000 poles in their service territory. At about 200 Watt-peak (Wp) per solar module, 200000 utility poles times 200 Wp yields the 40 MWp (MegaWatt-peak) capacity of distributed solar generation spread throughout the PSE&G service territory. Customers can see and feel connected to solar sited in their own neighborhoods. Per a press photo caption, ten different solar modules are being tested by PSE&G. Although I pressed Mr. Matos, he would not reveal the solar module vendors and models under consideration. In addition, proposals have been submitted with the micro-inverter mounted on the pole, mounting bracket, and on the module. I observe multicrystalline silicon solar modules best meet the specification. A single First Solar module does not even deliver half of the required 200 Watts, and monocrystalline silicon solar modules may not meet the price point. I believe the Enphase Energy micro-inverter (datasheet) is the leading contender for the PSE&G utility pole PV system, but incumbent central inverter manufacturers can also be expected to compete in the micro-inverter segment. The Enphase micro-inverter has a $200 MSRP (Manufacturer Suggested Retail Price) translating to about $1 per Watt for the utility pole application before volume discounts. Enphase deserves a dedicated Blog post, but I’ll close by noting their micro-inverter features powerline communications for remote monitoring, a useful feature to track 200000 distributed solar modules even if communications gateways may be required. PSE&G will leverage the ITC (Investment Tax Credit), SRECs (Solar Renewable Energy Certificates), 20 year depreciation, and sell power from the solar modules to the wholesale PJM Interconnection to limit the impact on electricity rates. Rate payers can expect residential bills to increase by an estimated 10 cents ($0.10) per month in the first year to about 35 cents ($0.35) per month in 2013. In subsequent years this rate impact will decline as the investment is depreciated. On the aesthetic front, most PSE&G coworkers didn’t even notice a solar test module mounted about 16 feet up a utility pole outside the corporate headquarters in Newark, New Jersey. Per this anecdote, the utility pole solar modules are unobtrusive to many casual observers. For further information about “Solar 4 All”, please see “New Jersey Utility Plans Major Solar Project” by Ken Belson for the New York Times and “Tapping Sun to Cost New Jersey Utility $773 Million (Update3)” by Jim Efstathiou Jr. at Bloomberg.com. The last seven days have been very productive for the Solar Electric Power Association (SEPA) with the Gainesville Feed-in Tariff, a “SEPA Statement on PSE&G $773 Million Solar Program Investment”, and an informative phone seminar on “Feed-in Tariffs: The Good, the Bad and What Utilities Need to Know“. I hope the New Jersey BPU will streamline the review process so this program stimulates the local economy in 2009. I had a question about the pole mounted utility solar. I think its a very interesting DG utility application. How is the power linked to the transmission grid. I thought line voltages were on the order of 1.2-kv, much higher than a micro-inverter output? Obviously I am not technically minded. Could you explain? I asked PSE&G the same question and mentioned in the post they selected the 200000 poles from 900000 total poles because they are distributing at the lower AC voltage. My understanding is the Enphase micro-inverter is specified at 240 VAC but can be tapped at 120 VAC.